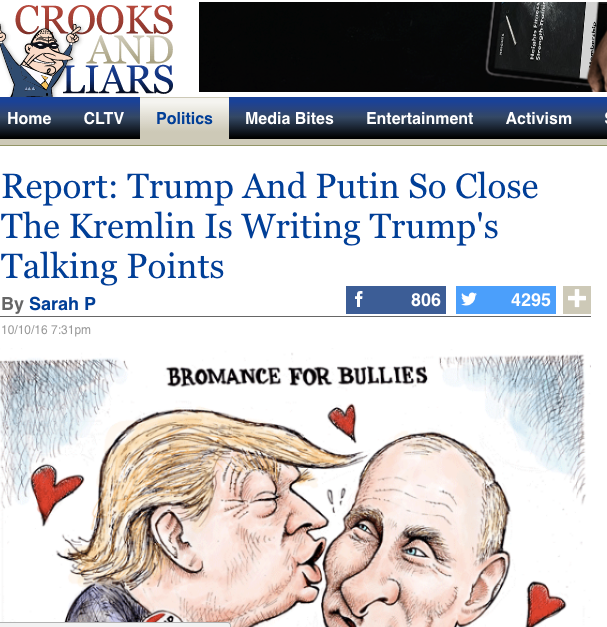 IN THE DEMOCRATIC ECHO CHAMBER, INCONVENIENT TRUTHS ARE CAST IN PUTIN PLOTS | "Global Possibilities"
October 11 2016, 6:14 a.m.
That article was shared almost 22,000 times on Facebook alone. In Nance’s defense, it is true that some unknown, random person posted a doctored email on the internet and claimed it was real, but that did not come from the WikiLeaks archive and has nothing to do with assessing the reliability of the archive (any more than fake NYT stories on the internet impugn the reliability of articles in that paper). Not one person has identified even a single email or document released by WikiLeaks of questionable authenticity — that includes all of the Clinton officials whose names are listed as their authors and recipients — yet these journalists and “experts” deliberately convinced who knows how many people to believe a fairy tale: that WikiLeaks’ archive is pervaded with forgeries. More insidious and subtle, but even worse, was what Newsweek and its Clinton-adoring writer Kurt Eichenwald did last night. What happened — in reality, in the world of facts — was extremely trivial. One of the emails in the second installment of the WikiLeaks/Podesta archive — posted yesterday — was from Sidney Blumenthal to Podesta. The sole purpose of Blumenthal’s email was to show Podesta one of Eichenwald’s endless series of Clinton-exonerating articles, this one about Benghazi. So in the body of the email to Podesta, Blumenthal simply pasted the link and the full contents of the article. Although the purpose of Eichenwald’s article (like everything he says and does) was to defend Clinton, one paragraph in the middle acknowledged that one minor criticism of Clinton on Benghazi was possibly rational. 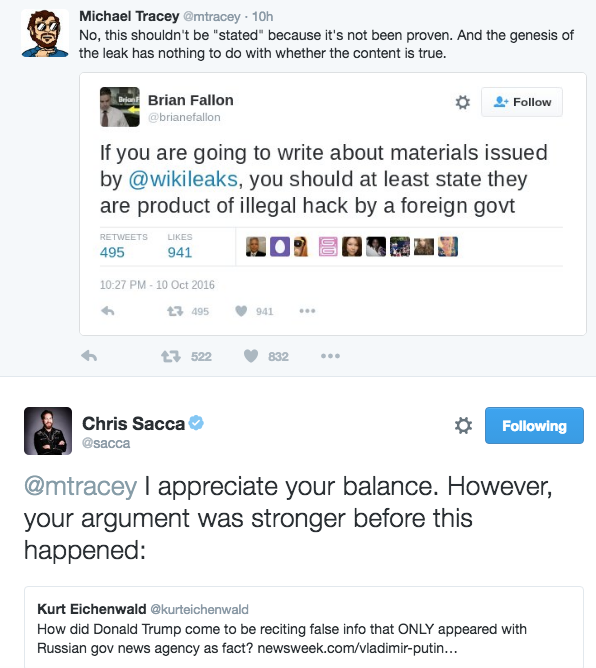 Once WikiLeaks announced that this second email batch was online, many news organizations (including The Intercept, along with the NYT and AP) began combing through them to find relevant information and then published articles about them. One such story was published by Sputnik, the Russian government’s international outlet similar to RT, which highlighted that Blumenthal email. But the Sputnik story inaccurately attributed the text of the Newsweek article to Blumenthal, thus suggesting that one of Clinton’s closest advisers had expressed criticism of her on Benghazi. Sputnik quickly removed the article once Eichenwald pointed out that the words were his, not Blumenthal’s. Then, in his campaign speech last night, Trump made reference to the Sputnik article (hours after it was published and spread on social media), claiming (obviously inaccurately) that even Blumenthal had criticized Clinton on Benghazi. That’s all that happened. There is zero suggestion in the article, let alone evidence, that any WikiLeaks email was doctored: It wasn’t. 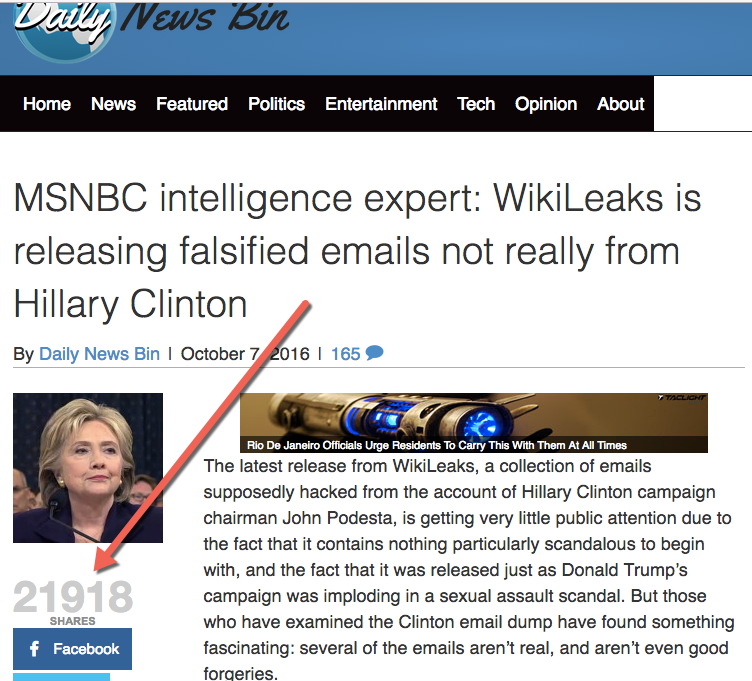 It was just Sputnik misreporting the email. Once Sputnik realized that its article misattributed the text to Blumenthal, it took it down. It’s not hard to imagine how a rushed, careless Sputnik staffer could glance at that email and fail to realize that Blumenthal was forwarding Eichenwald’s article rather than writing it himself. And while nobody knows how this erroneous Sputnik story made its way to Trump for him to reference in his speech, it’s very easy to imagine how a Trump staffer on a shoddy, inept campaign — which has previously cited InfoWars and white supremacist sites, among others — would have stumbled into a widely shared Sputnik story that had been published hours earlier on the internet and then passed it along to Trump for him to highlight, without realizing the reasons to be skeptical. In any event, based on the available evidence, this is a small embarrassment for Trump: He cited an erroneous story from a non-credible Russian outlet, so it’s worth noting. But that’s not what happened. Eichenwald, with increasing levels of hysteria, manically posted no fewer than three dozen tweets last night about his story, each time escalating his claims of what it proved. 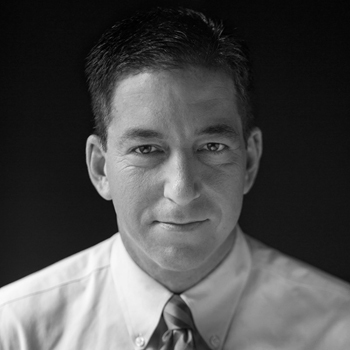 By the time he was done, he had misled large numbers of people into believing that he found proof that: 1) the documents in the WikiLeaks archive were altered; 2) Russia put forgeries into the WikiLeaks archive; 3) Sputnik knew about the WikiLeaks archive ahead of time, before it was posted online; 4) WikiLeaks coordinated the release of the documents with the Russian government; and 5) the Russian government and the Trump campaign coordinated to falsely attribute Eichenwald’s words to Blumenthal. In fact, Eichenwald literally has zero evidence for any of that. The point is not that his evidence for these propositions is inconclusive or unpersuasive; the point is that there is zero evidence for any of it. It’s all just conspiracy theorizing and speculation that he invented. Worse, the article, while hinting at these claims and encouraging readers to believe them, does not even expressly claim any of those things. Instead, Eichenwald’s increasingly unhinged tweets repeatedly inflated his insignificant story from what it was — a misattribution of an email by Sputnik that Trump repeated — into a five-alarm warning that an insidious Russian plot to subvert U.S. elections had been proven, with Trump and fake WikiLeaks documents at the center. By itself, this is not so notable: All journalists are tempted to hype their stories. But Eichenwald went way, way beyond that, including — as demonstrated below — demonstrable lies. But what makes it so significant is how many reasoned, perfectly smart journalists — just as they did with Nance’s “Official Warning” — started falling prey to the dual hysteria of Twitter group dynamics and election blinders, to the point where CNN featured Eichenwald this morning to highlight his major scoop linking Putin, Trump, and WikiLeaks in the plot to feed Americans heaps of Russian disinformation. To call all this overwrought deceit is to understate the case. In particular, the repeated claim that his story has anything to do with, let alone demonstrates, that “wikileaks is working w/Putin” or “wikileaks is compromised” is an outright fraud. The assertion in the second tweet — that “only those two [Trump and Russia] knew” about the article — is an outright lie, since by the time Trump cited it, it had been published hours earlier on the internet and shared widely on social media. Moreover, none of the documents released by WikiLeaks have yet to be identified as anything but completely authentic. Literally none of that happened. Or at least there is zero evidence that it did. These are smart, rational people falling for a scam. Why? It’s in part because Twitter fosters this group-think and lack of critical thought — you just click a button and, with little effort, you’ve spread whatever you want people to believe — but it’s also because they’re so convinced of the righteousness of their cause (electing Clinton/defeating Trump) that they have cast all limits and constraints to the side, believing that any narrative or accusation or smear, no matter how false or conspiratorial, is justified in pursuit of it. But while Donald Trump’s candidacy poses grave dangers, so does group-think righteousness, particularly when it engulfs those with the greatest influence. The problem is that none of this is going to vanish after the election. This election-year machine that has been constructed based on elite unity in support of Clinton — casually dismissing inconvenient facts as fraudulent to make them disappear, branding critics and adversaries as tools or agents of an Enemy Power bent on destroying America — is a powerful one. As is seen here, it is capable of implanting any narrative, no matter how false; demonizing any critic, no matter how baseless; and riling up people to believe they’re under attack. For a long time, liberals heralded themselves as part of the “reality-based community” and derided conservatives as faith-based victims of “epistemic closure.” The dynamics seen here are anything but byproducts of reason. 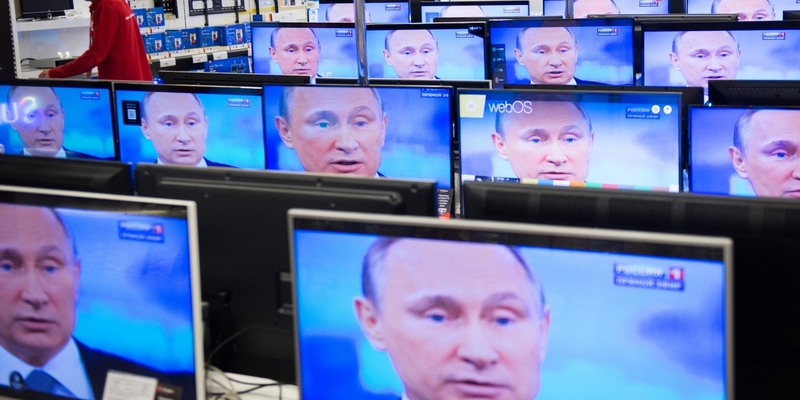 Top photo: TV sets in a shop in Moscow on April 16, 2015, during the broadcast of Russian President Vladimir Putin’s annual televised phone-in with the nation.